by Hugh Duncan. Published on 26 July 2018. In 1827 Robert Brown, a botanist, was observing pollen grains in water under a microscope and noticed they ejected tiny particles that performed a constant random jiggling movement, as if they were actually alive. He realised that they were moving due to being hit by the constantly, randomly, moving particles (i.e. molecules) in the water and this observation thus became evidence for the particle nature of matter and the kinetic theory. As a high school physics teacher, I showed my students the now-standard experiment of looking at smoke particles under a microscope to demonstrate Brownian Motion. The cause for their zigzag motions comes from them being bombarded by the randomly moving particles in the air. Einstein in 1905 went even further, by predicting how far the smoke particles would move as a function of time, based on the number of collisions they experienced and found a way of calculating Avogadro’s number, that huge constant that tells us how many particles there are in a mole (the chemical not biological ones!). And thanks to Einstein, he convinced us all that particles were real. The fun thing about this experiment is you can either do it for real, or you can model it on a spreadsheet such as Excel. First take a sheet of orthogonal graph paper (it doesn’t have squares but is a tessellation of equilateral triangles — see below left). Now choose a vertex somewhere near the centre of the paper and mark it with a pencil. Notice each vertex has six lines coming away from it. Call the line going right (east direction) ‘one’ then the next one 60° above east (anti-clockwise), direction ‘two’ and so on anticlockwise around the vertex. Thirdly take a dice and roll it. If it comes up ‘one’ then draw a line from your starting point one unit long, following the line of the paper east (i.e. to the right on the paper) which is the chosen direction ‘one’. If the dice comes up ‘two’, draw a unit line in direction two and so on. Roll the dice again and repeat this process with as many rolls of the dice as you can stand. What you draw is called a random walk (see below right). Orthogonal graph paper (left) and a random walk (right). Relating this to the path of a particle in a gas performing Brownian Motion, Einstein found that the displacement of the particle from its starting point was proportional to the square root of the number of collisions it had experienced. For those who want to try it on Excel, it isn’t difficult. Have a go and see how close the correlation is. Plugging these numbers into a spreadsheet, one gets the random walk shown below. 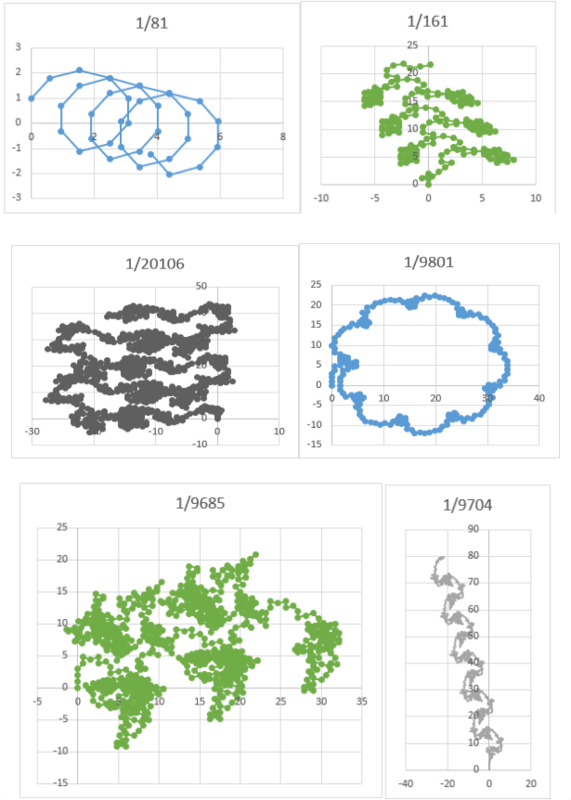 You can find some articles online that have plotted millions of digits of pi in this way. Some where each 100 000 is in a different colour, some in different bases or in 3D, and you get some amazing multi-coloured ‘clouds’ of points that look like works of modern art, like this link for example… which one might call ‘pi in the sky’? Anyway, there is a purpose to all this. Random number generators are used in computers and it is important to see that such ‘pseudo’ random numbers show the same randomness in their digits are ‘real’ random numbers. Here the cycle is complete and then occurs again. 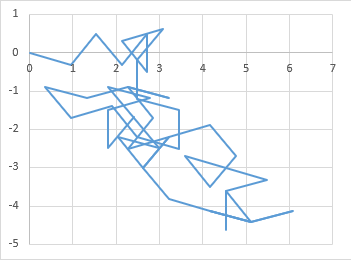 We can reproduce this walk on a graph and we see that this recurring fraction does not give a random walk, but instead a regular sort of ‘dance’ across the floor, in this case it looks to be a waltz. See the shape it has made on the graph, below left, showing the first four cycles of the pattern. Frawks that look like flags, doves and a spanner tree. A gallery of interesting frawks. This frawk of 1/61 is special in that the shape repeats every cycle by returning to the same starting point. Thus it does not actually drift across the graph but is stationary and fixed in space. It also has line symmetry that is tilted a few degrees west of north. This type of frawk seems to be uncommon. To me it looks like the head of a bull with earrings. Or if you turn it upside down, I see a chalice between two candles. I wonder what a psychologist would make of all that?! They’d come to take me away … ha ha! My neighbour said she saw an off-the-shoulder bustier. What do you see? There, that’s started a methodical study. The only other observation I will make at this point is that many of the frawks seem to show what I call a ‘flip flop’ pattern where a geometric shape is made on the left, say, then the same shape is made to the right, as the general direction of the frawk is forwards. The left-right shapes tend to be mirror images of each other. Does that observation continue to be common? Remember the article ‘Fractional Polygons’? If one was to apply the rules suggested there then this shape is actually a 10/3-agon! Look! An overlap between different branches of maths! Take the fraction 13579/99999 now, which gives a repeating decimal with the sequence of digits: 0.13579 13579 … The digits were chosen to follow another simple arithmetical sequence (add two each time) and lo and behold the frawk turns out to be none other than a pentagon! See second graph above. The fraction 26048/99999, with digits following the ‘add four each time’ rule creates a pentagram when plotted as a frawk. The repeating fraction 1234567890/9999999999 with its obvious pattern of digits gives us a decagon when plotted as a frawk. I wonder if any other simple geometrical shapes exist in this world? Is there a pattern to numbers that keep a fixed shape such as 1/61? Is there any hidden pattern that is common to prime number denominators? Would frawks drawn in three dimensions reveal any further details? Four? More? Is there any pattern in the drift direction of drifting frawks? Wouldn’t the patterns make interesting t-shirt logos?! Could the moves shown in a given frawk make a real dance of an aesthetic value? From top left: (1) The spring almost comes back on itself but slowly drifts south-east. (2) The grapevine shows that ‘flip-flop’ pattern that is common to many frawks. (3) My wife saw horses, I saw bison and it reminded me of famous cave paintings. Notice it also flip-flops symmetrically. (4) After 1/81, 1/9801 is the second in the series of epicycles (the next being 1/998001) and this one shows greater resolution to the ‘spring’. (5) My daughter saw a map, and I certainly thought it resembled Europe and Africa. (6) The snake flip-flops and wriggles sinuously north-west. 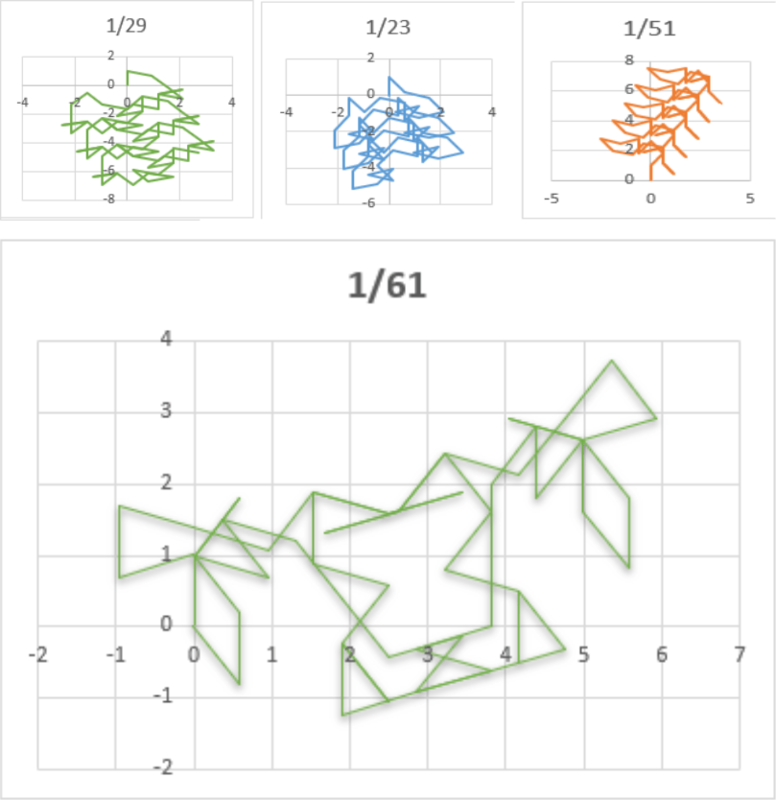 Using this method of plotting non-random walk graphs with the digits of fractions, I realised there must be some fractions’ digits that would actually spell words. Interesting! So I synthesized a string of recurring digits that would spell a phrase. See below the fraction and the frawk graph it creates…..